While researching The Well-ordered Town: a story of Saffron Walden 1792-1862, the story of religious Dissent in Saffron Walden emerged as an important theme – it was the members of the various Dissenting churches who tended to lead the way in expanding the town’s amenities and cultural life. 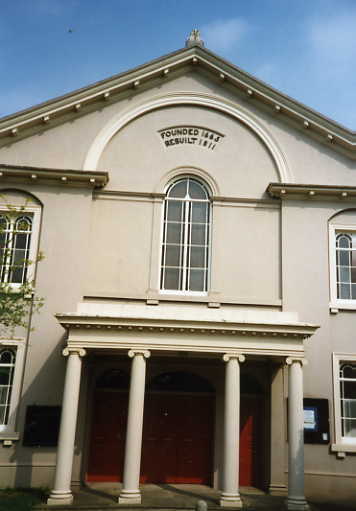 The archives of Saffron Walden Congregational (now United Reformed) Church are extensive and can be found in Essex Record Office – a lot of the material has been microfilmed and can be viewed at the ERO Archive Access in Saffron Walden Library. Via the Recorders’ website, I propose to share selected research notes for the benefit of others engaged in similar topics. Please bear in mind these are only abbreviated notes and would be best read in context. This material is made available to genuine researchers on condition that the Recorders’ website and the author are acknowledged in any resulting work – permission should be sought for publication in any medium. To understand more about 19th century Saffron Walden, The Well-ordered Town is still in print and can be obtained from the author. There are of course many more records than those noted here, I hope that this small selection suggests a rich reward for researchers – it is well worth dipping into the archives of Nonconformism! MINISTERS: Rev William Clayton left 1831; Rev Luke Forster came 1832, died age 38 in 1840; Rev Frederick Pollard came 1841. Abbey lane chapel erected 1694: free sittings 120 + other sittings 730 = total capacity 850; attendance 30 March: Morning service - 437 general congregation + 108 Sunday scholars = total 545 attendance;afternoon service - general congregation 501 + 108 Sunday scholars = 609 total attendance; Average last 12 months: general congregation 610 morning, SS 90 = total 700 people attending on average Sunday. 1815 - Sarah Watson suspended from communion for ‘deplorable misconduct’ which she admitted. April 2 1819 - letter from RD Thurgood in which he resigned his connection with the church on the ground of some new an important discoveries he had made of Divine truth, which prevented his convocations by sitting down at the Lords Table ‘which resignation as unanimously, and considering the pernicious sentiments, unsanctified tempers, and [unpincable?] walk of the person resigning, was gratefully accepted’. March 2 1820 - satisfactory report on James Starling and admitted (many others like this in future meetings). 27 July 1820 - James Smith had acted cruelly and violently towards his wife - ask him to withdraw from communion. 1821 - mention of Bertha Levi, one of oldest members, who had belonged to church since 1783. August 1821 - Mr. Player be no longer considered a member (after long address by pastor on this subject) - three voted against the resolution to remove him but it was passed. - Mr. Youngman resigned from church; 20 August - Joseph Haulton resigned. 1822 - pastor concluded at end of the year that it ‘one of the most eventful and important that has yet occurred in the history of the church’. Only one member removed by death; Mr. Player set aside for the disorderly walk an erroneous sentiments he evinced - ‘had the pastor and church acted in that step at all questionably, the subsequent conduct and temper of that unhappy fallen man and his abetters...’ he had resorted to ‘libellous conduct’. Church now enjoying some happy measures of tranquillity. (This was to do with when John Dane Player broke away in 1819 to form the London road Baptists and started properly in 1822. His father Joseph Taylor was excluded for a time from the Independents because he went to some of his son’s services). August 1st 1823 - letter read at Abbey Lane meeting re ‘our brother Mr. John Player and our sister Mrs. Frances Player having been called in the cause of providential events to fix their residence amongst you -commended to fellowship ‘happy in bearing testimony to their uniformlyblamelessand consistent conduct and behaviour since they have walked with us in the profession and in the privileges of the Gospel of Christ.’ = letter from Walworth July 29 1823 from deacons there. 2 Dec. 1823 - unpleasant rumours on Brother William Richardson’s moral conduct - deacons investigated and found some truth, but most fearfully magnified - summoned to appear, and suspended for 6 months. 1823 pastors report - ‘surrounded by foes implacable and malicious, their weapons have not prospered and signal and instructive events have checked the most violent of her enemies.’ 5 dismissed to the churches where they divided - Mr. And Mrs. N Gray, Miss M Gray, Miss MA James and Mrs. Clayden.2 retired owing to distance. May 1824 - re Richardson excessive drinking, profane language and contentious disposition - still fallen, reported the deacons.- with every feeling of pity, he was expelled from society. Dec. 1824 - only one brother excluded, in years report. Nov. 11 1825 - Nov. 3rd death of James Searle excellent and invaluable. 2 Dec. 1825 - Charles Porter allowed membership. Jun. 11 1826 - special church meeting re Searle:when as an officer of this church he met with those difficulties of which you are all apprised, he on Dec. 30 1825 seceded from his seat at the lords table and relinquished the discharge of his official duties until such difficulties were removed...’ so John Player and Robert Paul appointed deacons - agreed. Sept 1 1826 - Mr. Copsey absconded from his creditors, so expelled. 1826 report - several died and moved, others removed = their conduct appearing suspicious. 1828 report - 3 died, 6 moved, 8 new members. Nov. 1829 - Mr. Headland suspended for immoral behaviour Aug. 1827 was allowed back. 1830 report - Pastor leaving. He found them in a poor dilapidated building, he leaves them in a beautiful chapel; he found them few in number, he leaves them far more numerous - Dec. 31 1830. William Clayton (left April 1831). Starts 1838, includes reason why member left, died, etc.1838 to 1900, almost twice as many women as men were members. Robert Driver Thurgood fell out with the chapel in 1817. His son William was baptised there 1815; other children were Richard, Eliza 1816, Selina 1818, Charlotte 1828, Emma 1829, Emily 1832, Francis 1834, Eulalia 1839.William had sons William 1841, John 1842, Robert 1844. Hannibal Dunn and wife Sophia had son John Smith Dunn 1826. Robert Paul - son baptised 1825, and wife Maria bapt at her request 1822. 1816 Elizabeth Player age 18; 1817Eliza Ann Thurgood aged 1; 1823John Player age 68; 1832 Charlotte Porter age 6 of Gold st killed by accident; 1825 James Searle age 69 died on Nov 3rd of typhus; 1825 James Porter age 60; 1827 John Searle 72; 1828 Maria Mary Paul age 11 months; 1828 infant girl of H Dunn’s age 3 months; 1830 John Baron age 77; 1837 Marty Porter age 74 wife of late Samuel; 1837 Joseph Player 73; 1840 Rev Luke Forster died aged 38; 1846 John Player died Jan 7th, buried Jan 22nd; 1846 Mary Cox died through effects of poison, supposed to have been taken while in a state of insanity.